There are affiliate links on this page, which means that if you decide to click through and make a purchase, the price you pay stays the same but I might receive a small commission that will go back into developing recipes for you on the blog. Thanks for your support. 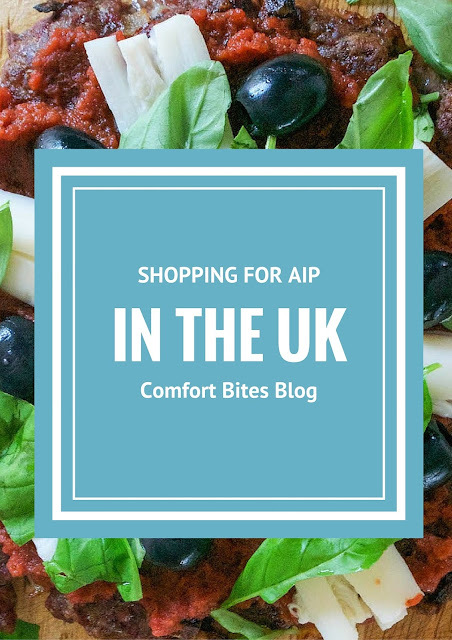 Shopping for the autoimmune protocol (AIP) in the UK. Is it just me, or do our AIP friends in the US seem to have all the best things: AIP wraps, Bison Bars, tigernut flour, cricket flour (yes, that's crickets) - while over here it's incredibly expensive to get hold of any of these things. So where do you go to buy stuff here in the UK, when you start AIP? What resources do you have at your disposal? Well, having been AIP (plus reintros) for around 2 years, I think I've cracked it. Here's how. Although you have to be prepared to make basically everything else yourself, there are a few items you can chuck into your shopping trolley that are ready to eat. Co-Yo is a brand of coconut yoghurt and it contains just coconut milk, tapioca starch and live (vegan) cultures. This makes it a good probiotic option. They also do flavoured yoghurt pots, but steer clear of the cacao one, at least to start with - cacao is a seed, and out on the first stages of AIP. Of all the supermarkets, I've found online supermarket Ocado to be the most paleo and AIP-friendly, for me. You can even type 'paleo' in the search bar and they come up with a list of paleo foods - all you need to do then is eliminate all the nuts, seeds, eggs and nightshades. They also stock a raw sauerkraut which is a great option to give your gut microbes a boost and promote healing. Not only does this mean you don't have to make it yourself, it means you can whip up a quick salad to have as soon as you get home - you open the lid with a tin opener. For probiotics, don't bother with sauerkraut that doesn't say it's raw - the pasteurised stuff will give you fibre and veggies but it doesn't have those all-important gut-supporting bacteria. Coconut milk is generally available in supermarkets, although I have found many contain guar gums and other thickeners. I still buy them, because there's no other option and I can't personally eat nuts or most dairy so can't drink other milks. Same for coconut cream. Tesco stock mild coconut oil that you can use for cooking anything in, because it's flavourless, as do Ocado. Ocado also stock coconut manna and extra virgin coconut oil, which is much more expensive. Coconut manna is a good option for using to make AIP frostings or icings - it's incredible spooned into dates as a quick dessert. Avocado oil is also AIP and can be bought from supermarkets - I got mine from Ocado, although it is a bit on the pricey side. Extra Virgin Olive Oil is good for salads and can be picked up easily - buy the best you can afford for the most peppery, fruity flavour. General 'paleo' shop-bought foods like Biltong, cereals and energy or protein bars can contain nightshade spices and black pepper so watch out for those ingredients. You might have seen paleo bloggers on social media sharing pics of their Cappello's pasta - I checked the ingredients in case anyone's considering getting it shipped over - and they can contain almond flour, so are not AIP. However do read the labels for yourself, as this information can change over time. Likewise, regular gluten free sausages might seem fine, but don't forget they are often filled with rice-based fillers. There are some brands that consist of just meat, herbs and spices, but do read the labels. Prosciutto is AIP, but check it hasn't been seasoned with black pepper or nightshade spices like cayenne, chilli or paprika. For a snack, I buy salted plantain chips which I can get from Morrisons or Tesco. They're fine for treats. There are a couple of brands starting to offer cricket protein bars in the UK - look out for them but check the pack for ingredients such as nuts or seeds, which are eliminated in the initial stages of AIP. The brand of gelatin I use for making panna cotta, gummies and all sorts of other things is Great Lakes Gelatin - the red can is great for those uses, but if you're drinking it in smoothies, you'll want the green can. Online, have a look at The Gathered Goods Co - they stock some incredible AIP ingredients like pure honeycomb, coconut syrup, cassava flour and other items. Abel and Cole and Riverford Organic provide organic vegetable boxes to your door. I rate both really highly, you just need to specify not to include nightshade veg (aubergines, tomatoes, chillies) or it might be easier to make up your own box for delivery each week. Other than that, I've found the supermarkets great - the organic ranges are improving across the board really. You can sometimes find spaghetti squash in Waitrose stores (grab a couple when you see them, they're in quite short supply), and I've found my local Tesco stocks fresh plantains, which always arrive green, so that's best for making tostones or plantain chips with. Keep them in the fridge to keep them greener for longer. I've found fresh turmeric in larger Morrison's stores - buy a load and store in the freezer for grating into your dishes. Grate them straight from the freezer. I've also found frozen cassava chips in Morrisons, which is good for making AIP doughs and pastries. Check out meat suppliers like The Well Hung Meat Co, Primal Meats and Farmer's Choice, which are all online and deliver to your door. Farmer's Choice are free-range and are a good source of most meats, also game meats. Abel and Cole and Riverford offer organic and free-range meats too. Go for organic where you can, and free-range. Buying things like offal (liver, hearts, kidneys, oxtail) will help keep the costs down, as will buying minced meat and cuts like chicken thighs rather than breast. For lamb, go for lamb neck or shank. Pork hocks are also a good, cheap alternative to pork leg or shoulder, especially when cooked slowly. I'm not a big fan of buying AIP compliant flours for baking, mainly because I have found it so expensive to buy online with delivery costs. A packet of flour can set you back around £10 or more. So I just manage with what I can buy locally, although if you're desperate for some carob powder or tigernut flour, you might be able to find them on Amazon or check out The Gathered Goods Co. Coconut flour can be bought from supermarkets (Ocado will have it), and I've found tapioca flour there, too. New flours are cropping up all the time as demand for this way of living grows, so keep an eye out whenever you're shopping. Check out The Gathered Goods Co for coconut and cassava flours - visit their AIP section for more. The simplest thing you can do when you start AIP is to keep everything nice and simple. Start by cooking vegetables and meat, seafood or fish - keep a lookout for more specialist ingredients as and when you find them, rather than spend a lot of money stocking up from day one. Thank you so much for writing this blog! I have to go on an aip diet and have been painfully putting it off due to not knowing where to start. This blog has really made me trust that’s it’s not going to be a difficult as I think, so thank you for that reassurance! Fantastic Donna! I hope it goes well for you.